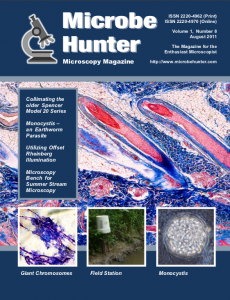 Welcome to the 8th issue of MicrobeHunter magazine. You can download the PDF and order a printed version. In this episode, the author describes the repairing of a stereo microscope. Stole it from a bird! Examining Monocystis parasites from a worm. A short photo journey through the world of fibers that can be found in a household. Giant Chromosomes in Drosophila spp. Sometimes it is more convenient to take the microscope out into nature, than to take nature into the lab.